Junk Removal Baltimore: Junk or Charity? As the holidays draw ever nearer, you may find yourself wondering how you can give back to the community while still clearing up some space for your new Christmas or Hanukkah presents! Many people choose to take this time of year to go through their current items, including clothing and furniture, and decide what can be donated to charity. Of course, some items have been a little too well loved for someone else to use. If this is the case, it’s time to consider junk removal instead. So, how do you decide what is junk, what should go to charity, and what you should sell? Instead of remaining immobilized and not knowing what to do with your items, feel free to use this guide to free up some space this holiday season. While selling may seem like a good option, keep in mind the steps you need to take in order to sell your items. Consider their value. While selling can be a great way to get some money back (gift money, anyone? ), there are a few things to think about before you make that decision. First, is it worth more than what it would cost to organize a garage sale, list the item online, ship it anywhere, etc.? Second, do you have the time and the drive to organize the sale? If you know you are not likely going to get on your feet and do something about this item you want to sell, you’ll end up holding onto it for years longer. Save yourself both the guilt and the time of convincing yourself that you’ll sell it if you suspect deep down that you won’t. Now, if you are looking to make money, then that’s a different story! Selling is a perfect choice. However, for those who are simply looking to declutter their space and make more room for holiday items, don’t make this trickier than it needs to be. Everyone has a different standard for what can be donated. For some, it’s anything they don’t use anymore, regardless of the condition it’s in. For others, it is something in perfect condition that is still in fashion. We know it’s somewhere in the middle. Keep in mind that the holidays are a busy time for the charities in the Baltimore area, so you want to give them as little extra work as possible. By donating things of decent quality that are in good working order, you can help those volunteers have an easier time finding your items a new home. When in doubt, throw it out! If you are worried about the condition, then it’s probably garbage. A great way to know if you should donate something is to think if you could sell it. If it’s in great selling condition, but you just can’t be bothered to sell, then donation is a perfect choice. This is the season for giving, so we know that the charities in the area would be delighted to have your donations! Winter coats and other warm apparel are perfect for those families who need to keep warm. Some items will very obviously need to be tossed, and that’s totally okay! There is no reason to feel guilty. For those of you who struggle with hoarding tendencies or procrastination, we know how challenging it can be and how overwhelming it is to get rid of your items. Do not let your indecision get in the way of clearing your space and preparing you for the holiday season. Instead, just put everything into a bag and let it go. 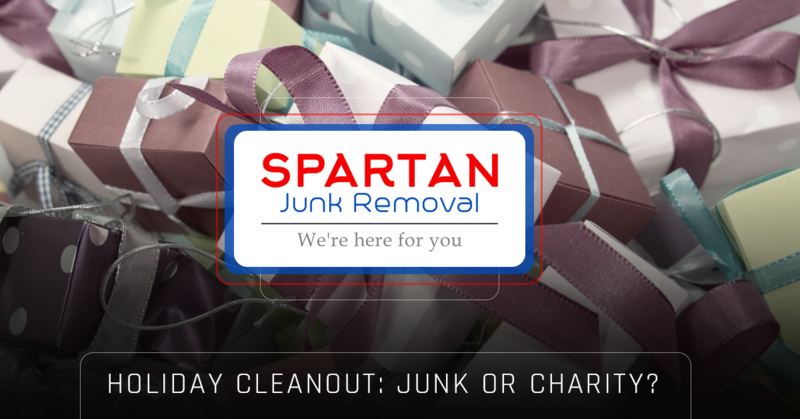 There are junk removal companies out there, including Spartan Junk Removal, who will take a look at what you have had us haul away and determine what condition it is in. We are dedicated to making green and community-conscious decisions with the items we take away. If it can be donated or reused, we will make sure it is! Don’t be scared to free up that needed living space in your home and experience the relief that always follows. Reach out to our team today! We wish you all happy holidays, and we hope that we can help you make some more space in your home!